Nothing on the table shouts “spring!” quite like roasted asparagus. Did you know that asparagus spears are the first heavy shoots that spring from the ground as soon as the weather warms enough? Asparagus is a permanent planting, growing larger and more prolific with each season. Only the heavy-bodied shoots are harvested. As soon as thin wiry shoots replace the heavy ones, harvest is over. 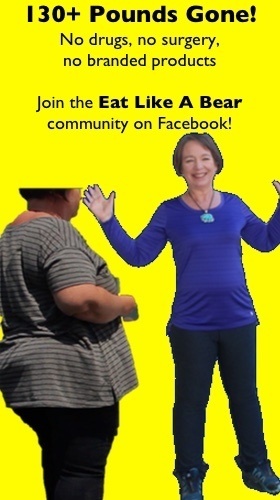 A short harvest at a high price! When you find an asparagus sale in the spring, you want to take full advantage. Buy enough for three or four meals. Fresh asparagus does not last long even in the refrigerator. Here is a solution: roast it all. 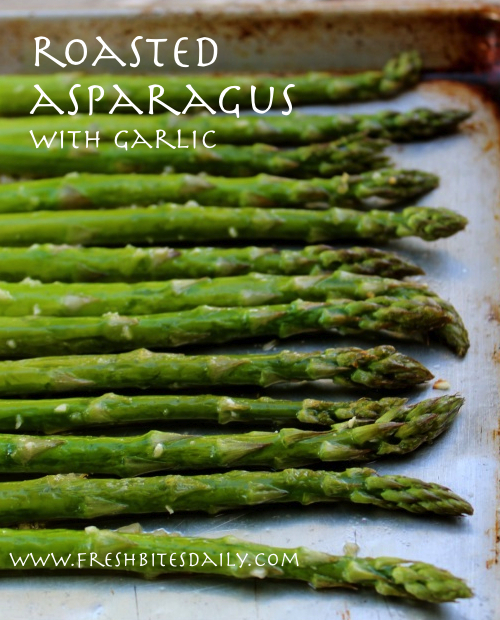 Roasted asparagus keeps twice as long as fresh asparagus and can be used in a number of quick and simple dishes. What about chilled roasted spears served with a mustard sauce? Consider warming the asparagus briefly for breakfast topped with scrambled egg and broken bits of bacon. Roasted asparagus spears can top a green salad or be tucked inside a cheese omelette. Is your mouth watering yet? Mine is! What if you do not want to eat asparagus every day for a week? Freeze some. Cut your surplus roasted asparagus spears into one inch pieces and freeze them on a cookie sheet, spread out single layer. (You can even use the same pan you roasted in, not even wash it between. The oily sheet will willingly release the frozen asparagus.) When the pieces are frozen solid, loosen them with a spatula and put them quickly into a freezer bag. You will love having this precooked asparagus to drop into stir-fries, soup, and scrambles. What a treasure! Roasting asparagus is embarrassingly easy. First follow the guidelines for selecting and handling fresh asparagus. The following recipe is for one pound of asparagus spears. Multiply it as many times as needed. With each additional pound you may need less oil. I’m never concerned about too much oil or garlic because after the roast is complete, the resulting garlic oil is fabulously flavored, wonderful drizzled over anything but dessert. Preheat the oven to 400 degrees. Do not put the asparagus into the oven until it has reached 400. This way the asparagus roasts quickly and neither the garlic nor the oil will burn. 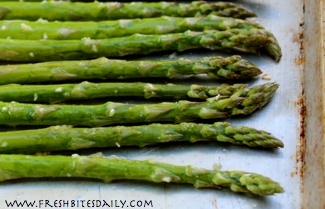 Place the cleaned asparagus on a rimmed cookie sheet. Drizzle on the oil. Sprinkle on the salt and the crushed garlic. Toss gently with a spatula until every spear is coated with oil. Roast until tender-crisp. Ten to fifteen minutes is usually adequate. The color should be bright green. Remove the pan from the oven and toss the spears again to more fully coat with oil. Remove from the hot pan so the asparagus will cook no further. If you have hit a really big sale, you will probably repeat the roasting process through another pan or two. Just be sure to keep your spears in a single layer so they roast and not steam. Steaming does not produce the rich flavor of roasting. Enjoy these spears hot out of the oven or at room temperature. Have some for lunch and more at dinner. Enjoy the bounty. It’s spring!